Retaining walls are structures that are constructed to hold back soil and water behind. Of all the materials like concrete, timber, and boulders used in the construction of retaining walls, gabions are the best choice. Gabion retaining walls are best used in holding unstable embankments. 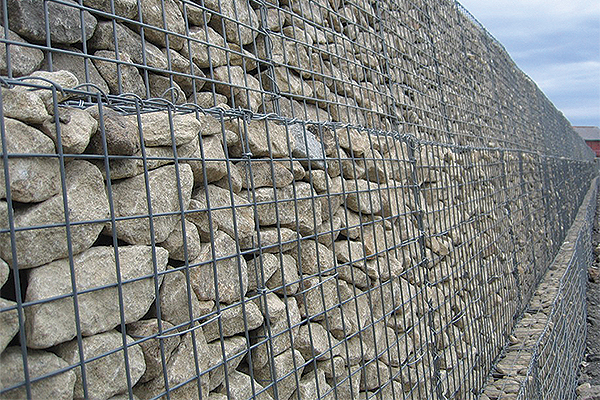 Gabion walls are similar to a big cage filled with rocks. All such smaller cages are linked together and tied with wire mesh to create a monolithic structure. Gabions are similar to gravity retaining walls where the mesh cages are filled with angular rocks to offer a rigid face. Gabions are designed in a way to make them last longer ranging from 50 to 100 years. The usual steel meshes used in gabion retaining wall designs are being replaced with PVC coated wire wishes to protect the structure from corrosion which is the major limitation of the structure. Apart from using as embankments, gabion walls are used in landscaping and architectural cladding to big buildings. For designing a retaining wall, many factors like site location, width, depth and length of the wall, type of soil and the load behind the retaining wall should be considered. While constructing large gabion walls, heavy gabions structures are used as a base to provide stability and improve the resistance from sliding. For the retaining wall to be strong there is a need for a strong retaining wall toe. The depth of the wall toe increases with bigger walls. The depth of the toe of a gabion retaining wall increases on soils which are softer. A soil investigation is a compulsory aspect when building the retaining walls over a large spread of area. Other aspects like air flow or intensity of winds in the area should be considered to see if the retaining wall can bear the loads. To handle the unexpected loads which may appear, the base of the gabion walls should be made thicker. If the retaining wall construction site has unsuitable soil like gravel, the soil should be replaced. Traditionally the gabion retaining wall is filled with quarry rocks. The scarcity and transportation costs involved for carrying the quarry rocks to the project site lead to the replacement of quarry rocks with other filling materials. The alternatives used for gabion boxes are smaller stones, quarry dust, red soil. Steel wire mesh and geo-textiles are also predominantly used in the construction of gabion boxes. The role of geo-textile is to protect the soil from being eroded. There are firms which deal in the sale of gabion boxes for various projects. The gabion retaining walls are not only used to prevent soil erosion but also help to maintain the stability of slopes. Based on the type of mesh used in gabion box manufacturer, its application differs from railway projects or highway projects. Gabion mattresses are different from boxes with respect to the dimensions. They are shorter in height and are used to prevent wave erosion. Gabion sacks are used for emergency corrosion prevention like river flooding.